Davam Urgent Care located near Tomball, TX provides walk-in urgent care services for the whole family. Every patient who visits our clinic will be treated by a board-certified medical provider. We are able to treat a large variety of illnesses and injuries including colds, flu, cough, sinus infection, dehydration, urinary tract infection, pink eye, ear infection, bone fractures, sprains, and many other non-emergent issues. In addition to treating illnesses and injuries, Davam Urgent Care can also perform sports and school physicals and administer flu shots. Short wait times.- Our clinic is open 8am-9pm, 7 days a week. Wait times are typically 10 minutes or less. We also offer online check-in to allow for a more efficient visit. We are equipped with a digital x-ray machine and fully certified lab.- Davam Urgent Care will always have a certified Radiology Technologist on staff to take x-rays. We also offer EKGs, strep test, flu testing, urine testing, and many more on-site with same day results. Our services are affordable.- Treatment at Davam Urgent Care is much more affordable than visiting a costly freestanding emergency room. Along with accepting most major insurance plans including Blue Cross and Blue Shield, Medicare, and Unitedhealthcare, we also offer prompt-pay options for those without health insurance coverage or that have high deductible plans. 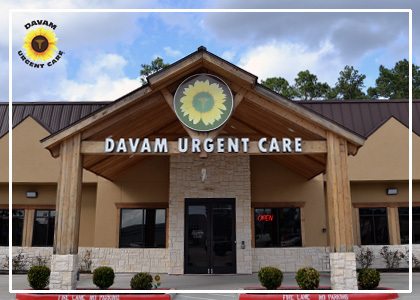 For more information on Davam Urgent Care located near Tomball, TX and the services that we offer, please visit our website www.Davam.com or call (281) 583-1980. Our family clinic services the Tomball neighborhoods of Timberwilde, Northwoods Estates, Stonebridge Ranch Estates, Spring Creek, Holly Creek Estates, Woodtrace, Northgrove at Spring Creek, and many more. We also serve the Tomball zip codes of 77375 and 77377.